DFS, the UK’s biggest sofa manufacturer and retailer, has released a new advert, promoting the Spring 2019 collection of sofas. 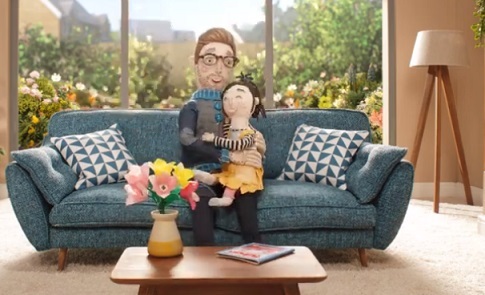 The 30-second spot, created by advertising agency krow communications and dubbed “Welcome in Spring,” uses the iconic, hand-crafted Aardman characters which first broke with DFS’ Christmas delivery ad in November 2016, and gives viewers a glimpse into the living room of several families, where hand-made DFS sofa gather all of the members for fun activities and quality time spent together. The advert, scored by Georgie Fame’s single “Let The Sunshine In,” ends with the voiceover highlighting that every DFS sofa is handmade just for you and adding the tagline “dfs – making every day more comfortable”. DFS has more than 100 stores across the UK, Ireland and Holland, and offers a wide range of sofas handmade to order, allowing customers to buy fabric sofas, leather sofas, corner sofas, recliner sofas, and more with 4 years interest-free credit (0% APR) and a 15-year guarantee. In addition, it also offers a selection of brands that are exclusively at DFS, such as French Connection, HouseBeautiful, Country Living, Sofa Workshop, and more. DFS, which has been manufacturing sofas for more than 45 years, has also put together a sofa buying guide in the attempt of helping families get comfortable on a new sofa. In 2016, as the official homeware partner for Team GB at the Rio 2016 Olympic Games, it created a limited edition Britannia range of sofas for the headquarters of Team GB in Rio de Janeiro and released an advert celebrating the “Great Brits”. In 2017, the retailer teamed up with the British Heart Foundation to support their fight against coronary heart disease and encouraged people to donate their old sofas, highlighting that the money raised will then be used to fund the organization’s work.